Toyota Material Handling Australia has launched a new range of counter-balance internal-combustion forklifts. The new range, called the 8-series, will introduce a handful of new fuel-saving features and a number of ergonomic and durability improvements. The 8-series will also include, as standard, all of Toyota’s latest safety features, including a vehicle travel-speed control system that allows operators to limit the speed of the forklifts. 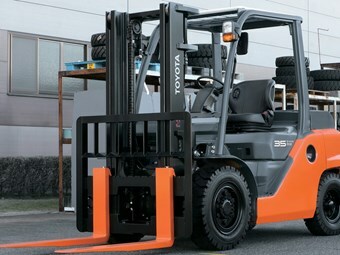 This is in addition to the regular Toyota forklift safety features, such as the system of active stability and active mast controller function which work in conjunction to prevent roll overs. The main ergonomic improvements include an increase in floor space and step size, and a decrease in the size of the steering wheel. The chassis has also been given an upgrade, with a fully stamped steel plate construction and a reduction in the use of cosmetic plastic. "Reliability has been optimised with a 55 per cent increase in engine radiator size and by adopting an external hydraulic cooler," Toyota Product Manager Jim Lobow says. Three new fuel-saving features have been added: a load-sensing power-steering system that aims to reduce power demand on the engine, a low-power eco-mode option, and a programmable auto engine off system. The 8-series comes with a variety of options, including the choice of LPG, dual-fuel or diesel, with capacities ranging between one and eight tonnes.